About How Music REALLY Works! 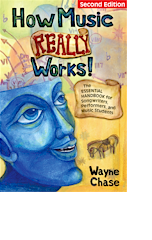 Wayne Chase's How Music REALLY Works!, now in its 2nd edition, is the classic “how-to” manual for anyone interested in playing, singing, or writing emotionally powerful music and lyrics. For book details, click here.